The results of the Programme for International Student Assessment’s (PISA) exercise of ranking school systems by testing students’ scholastic performance have been followed intensely by national authorities and the media. Has it helped or hindered the improvement of education systems though? 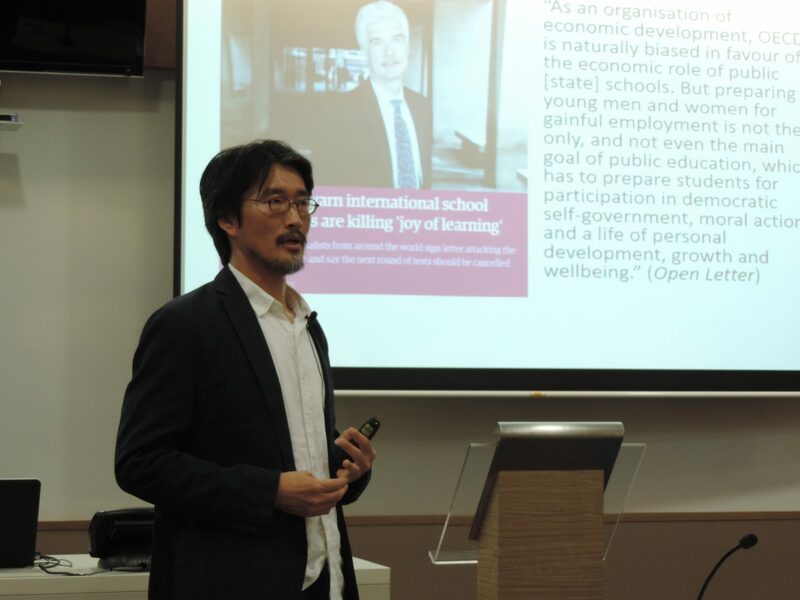 Much of it depends on national contexts, said Dr Keita Takayama (University of New England, Australia) who spoke at The HEAD Foundation on 15 April. But there is certainly a “PISA effect” that has played into the agenda of politicians and the media, who sometimes exaggerate the “politics of crisis”. The Organisation for Economic Co-operation and Development (OECD), which administers PISA, holds no legally binding power. Yet countries follow their recommendations in areas such as education, even forking out money for fees to participate in PISA exercises. Many non-OECD countries participate in PISA, including Shanghai-China and Singapore, which have regularly been ranked highly. After the introduction of PISA in 2000, many countries started to implement national standardized tests, for better or for worse. This was generally the way for authorities to prepare students to ace the PISA test and bolster national rankings. In the case of Japan, as Dr Takayama pointed out, the government managed to push through with national standardized tests even though it has been a controversial issue since the 1960s. This was because the then Japanese education minister played up an atmosphere of crisis when the 2003 PISA results showed Japan’s ranking drop. Yet the difference of scores between top ranked national school systems were not statistically significant. Due to this “wrong” method of presenting the results by ranking countries, Dr Takayama said, the media and politicians leapt at the chance to push through with the agenda of the day. This was what he termed the “politics of education reform”. Dr Takayama raised other concerns about PISA testing too. Citing cultural indifference, he gave the example of the PISA’s reading tests in Japan. When test questions were being translated, Japanese experts found that PISA’s bias towards Western-style objective readings of the meaning of texts was hard to reconcile with an Asian, affective understanding of the literary arts. Nonetheless, Dr Takayama was not completely critical of PISA tests, noting that much depends on how PISA and its results are enacted by domestic policymakers.